Nothing beats this childhood favorite. 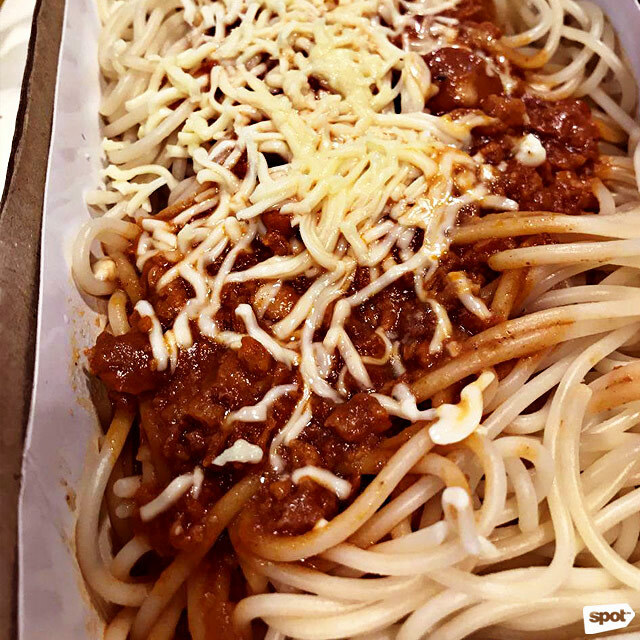 (SPOT.ph) If you grew up in the Philippines, you'd know that classic Pinoy-style spaghetti is a comfort dish that's pretty hard to beat. Its distinctively red, rich-and-sweet meat sauce made of hot-dog bits and ground beef can make any sweet-spaghetti fan's heart flutter, while the heap of cheddar cheese on top makes for something beautifully creamy and downright nostalgic. We've sorted through the all-time hits and rounded up the best choices for your sweet-pasta fix based on sweetness, overall flavor, and sauce-to-noodle ratio. Is your childhood favorite on the list? Trust convenience-store food for no-brainer grub or an early-morning quick fix after a night out—and this spaghetti is exactly that. 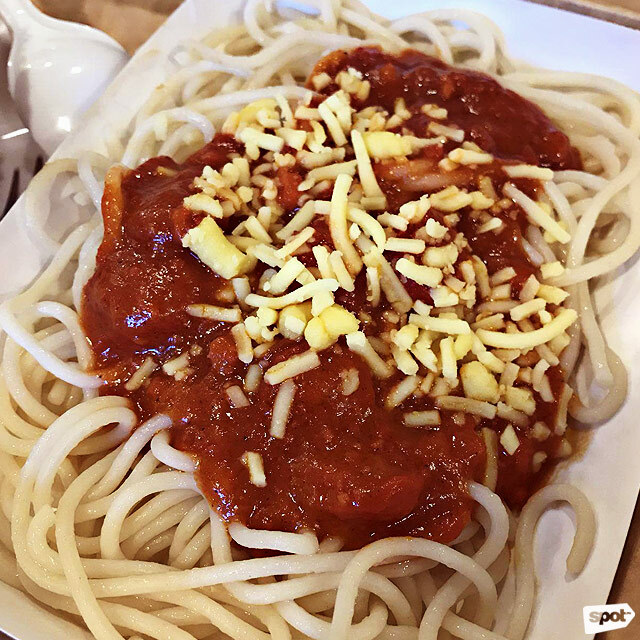 Ministop might be popular for their crispy fried chicken, but not many people know that they also have tasty Pinoy-style spaghetti. Although served in smaller portions than its higher-ranking rivals, this snack-sized version is filling enough to last you until your next meal. 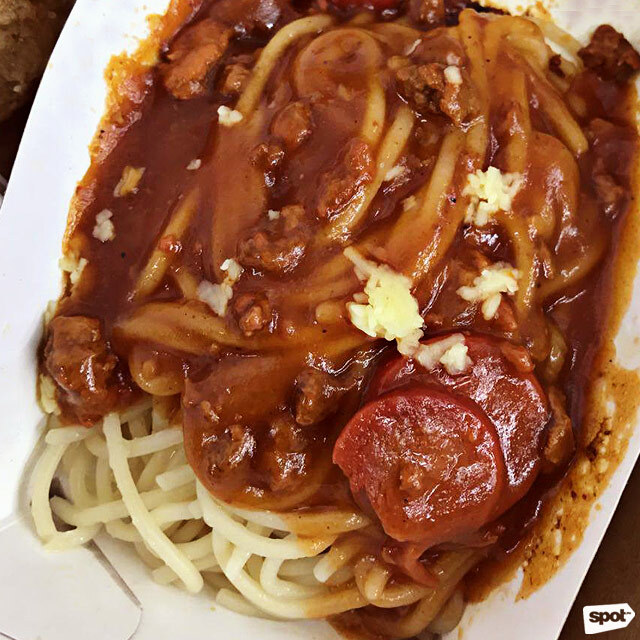 You might find Ministop’s spaghetti on the sweeter side of the flavor spectrum, but its sweetness is nothing too cloying—you might even say it could use more sauce. See a list of Ministop branches. People don’t always go to Goldilocks for savory meals, but if there’s another thing the restaurant is known for aside from cakes and bread, it’s their wide assortment of merienda offerings. 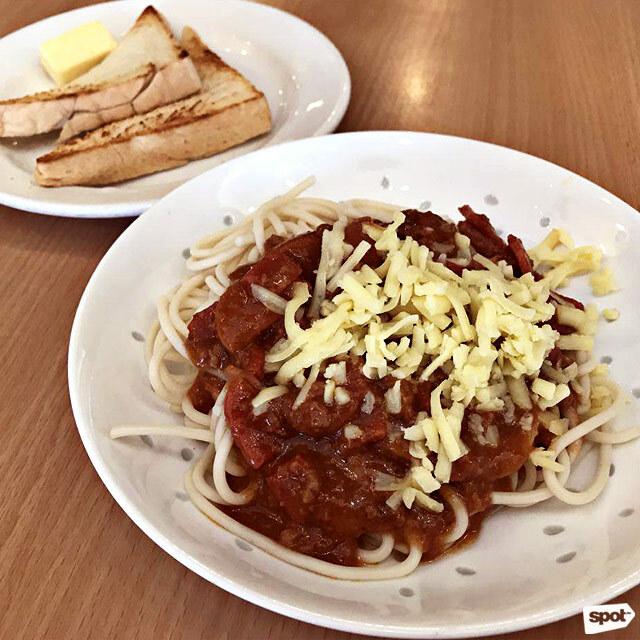 From puto’t dinuguan to the classic palabok, the bakery also serves up sweet spaghetti that’ll give you fond memories of your childhood. You’ll love this version for its generous cheddar topping, which adds a salty bite to the mildly sweetened meat sauce. When mixed in with the soft noodles and slightly orange-y sauce, the melted cheese makes the dish creamier, too. Bonus: They use cheese-filled hot dogs for all you cheese lovers out there. See a list of Goldilocks branches. Judging from its appearance, you’ll know this version has sauce that's completely made from scratch—a good thing if you’re not a fan of fast and processed meals. It would’ve passed for a sweet Bolognese if not for the hot dogs and cheddar-cheese garnish, but who’s complaining? 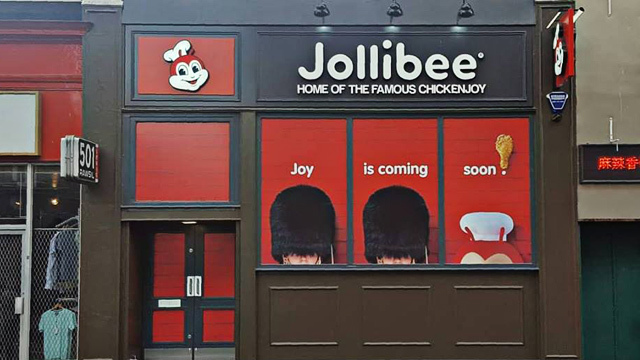 It’ll still satisfy the kid in you with its familiar Filipino flavors. Though it can actually do without the garlic bread on the side, the noodles are perfectly al dente, just the way we (adults) like it. You’ve come to the right place if you’ve already had one too many bright-red spaghettis in your life and are completely over it. The Spaghetti Supreme at Greenwich has a naturally subdued color, which makes us think this version uses real, good-quality sweet tomato sauce. Leaning more on the salty side, the spaghetti is great for people who love to drown their noodles in sauce. Scarfed down the noodles too fast and have a bit of sauce left? Don’t worry, because there’s some buttery garlic bread to wipe the plate clean. The spaghetti, which uses mushrooms instead of hot dog, is also served piping hot, so the grated cheese melts and coats the noodles and ground beef. See a list of Greenwich branches. For years, you might have known the McSpaghetti as too tangy to qualify as Pinoy spaghetti, but the “new and improved” recipe of McDonald's says otherwise. Changed just recently to adapt to the Filipino palate, the McSpaghetti is a strong contender in the sweet-style spaghetti wars. This version’s noodles are a bit overcooked, but that can be easily overlooked once you get a taste of their cheesy meat sauce. The salty cheddar on top tempers the peppery sauce’s sweetness, while each forkful will give you a decent amount of meat and hot dog. 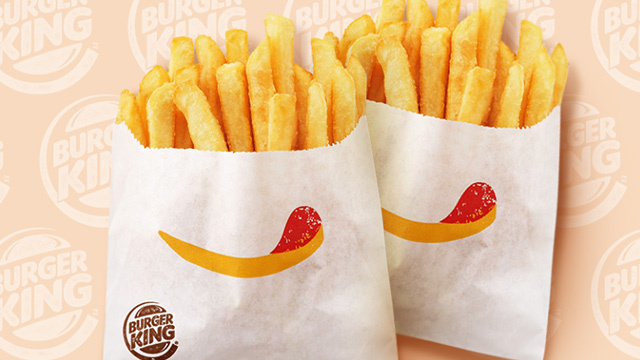 See a list of McDonald’s branches. 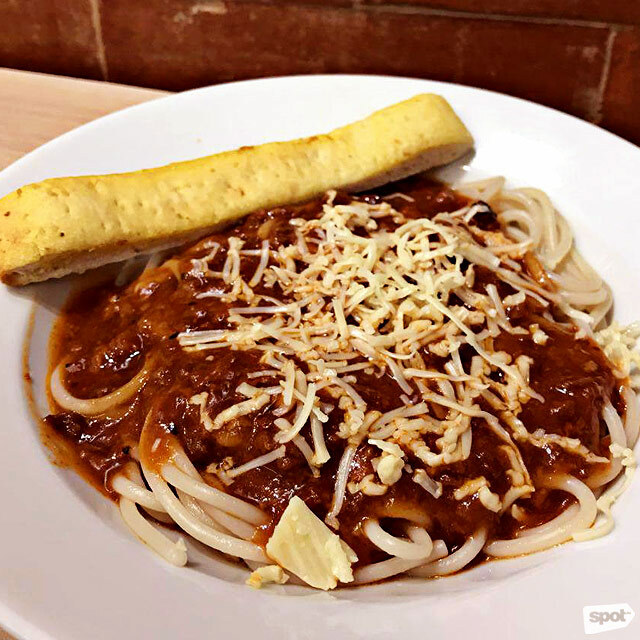 Makati Supermart Coffee Shop has been delivering cafeteria-style Filipino food at Alabang Town Center for years, and their cult-favorite sweet spaghetti has diners coming back time and again to the South of the Metro. Its popularity originally started through word of mouth, but thanks to social media, it now has a steady following online—and we understand why. 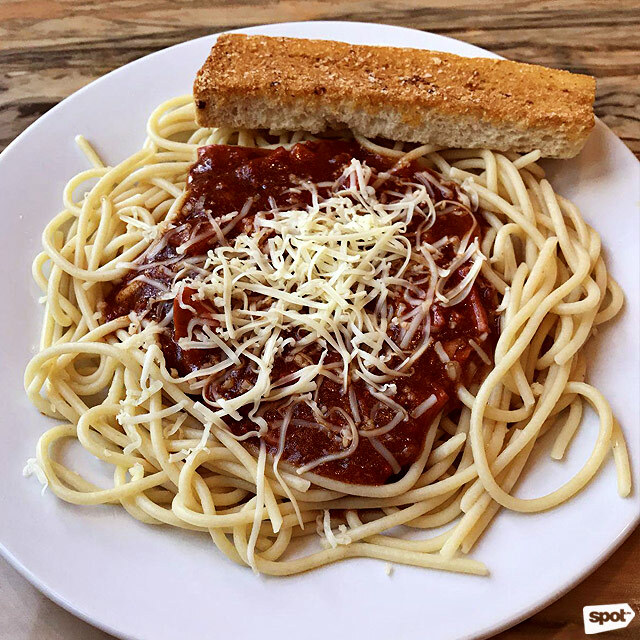 If you like your Pinoy spaghetti meaty, then this version is perfect for you because it uses at least three kinds of protein, including hot dog, ham, and ground beef. We suspect the secret to this spaghetti’s success is the pickle relish, which gives this version that distinctive sweet-tangy flavor. 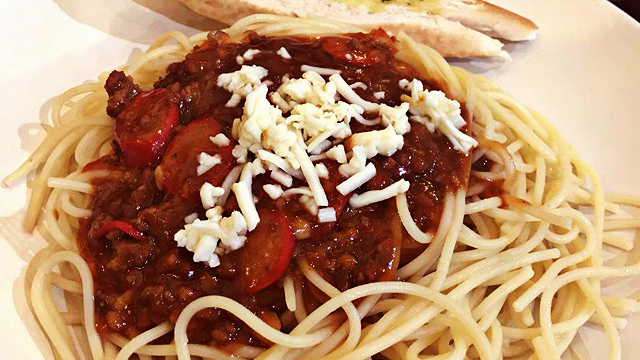 Pro tip: If Alabang is too far, they serve the exact same spaghetti at Unimart’s The Coffee Shop. Makati Supermart Coffee Shop is at Makati Supermart, Alabang Town Center, Alabang, Muntinlupa City. The Coffee Shop is at Unimart, Greenhills Shopping Centre, N Western Street, Greenhills, San Juan City. It comes as no surprise that Jollibee’s Jolly Spaghetti still ranks high on our list after all these years. 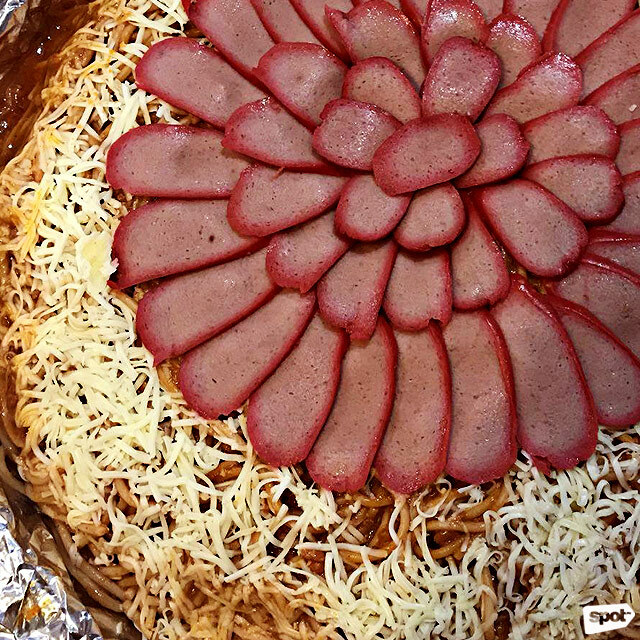 It’s generously topped with cheese and loaded with chunks of hot dog and ground beef. Rumor has it that this spaghetti uses condensed milk to pack on the sweetness, a definite plus if you have a sweet tooth. It’s basically comfort on a plate—if you’re like most people, the Jolly Spaghetti might be one of your first memories of traditional Pinoy-style spaghetti. With its familiar sweet and spicy flavor, this version is perfect for those who like their spaghetti fuss-free with a hint of nostalgia. Amber has always been a no-fail place for sourcing dishes for your next potluck party. 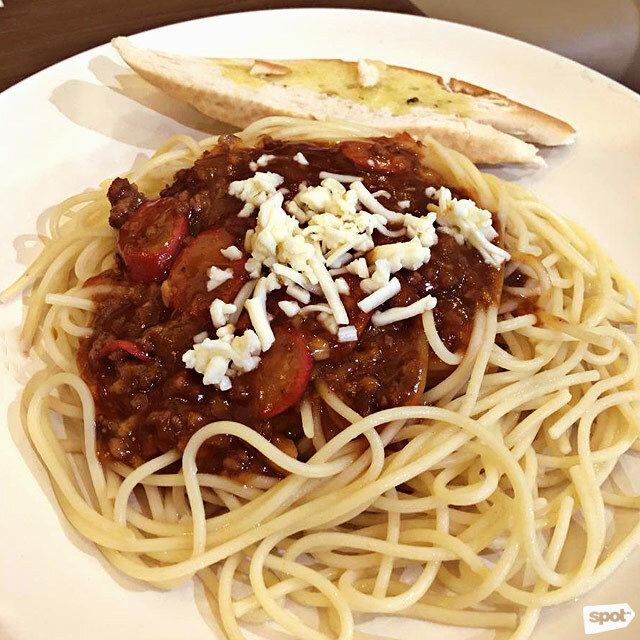 Their best-selling Spaghetti with Meat Sauce has heaps of cheddar cheese and generously sized hot-dog slices decorating each bilao platter. Besides that, the spaghetti has just the right amount of sweetness so it’s not as cloying as it appears to be. When combined with the sauce, the vibrantly hued cheese adds another layer of saltiness and creaminess to every bite, making this version a winner. This version is probably the meatiest and sauciest of the bunch; no wonder it comes with crunchy and buttery bread to mop up the last of the sauce on your plate. You’re bound to have at least a spoonful left, which is actually a good thing. And even though their slightly spicy spaghetti seems to taste more tangy than sweet, it doesn’t lose its Pinoy-spaghetti appeal due to the generous bits of hot dog and sweet ham. Perhaps the only downside is its mildly flavored cheese that doesn’t really enhance nor add anything to the pasta, except maybe for visuals. Nevertheless, this could be one of the best sweet spaghettis you’ll have, and you’ll be savoring each forkful. See a list of Buddy’s branches. 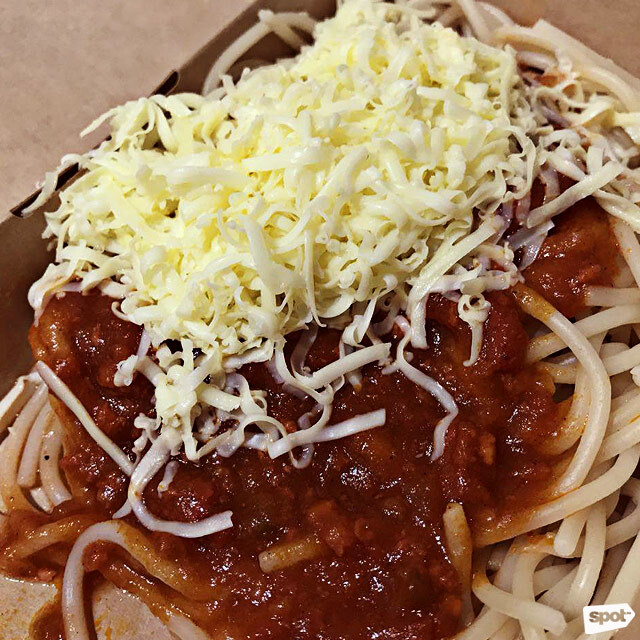 You’ll never doubt spaghetti that’s so confidently named and branded as “cheesy meattie” after having Mister Donut’s version. And it’s no understatement that this sweet-style spaghetti is, indeed, cheesy and protein-laden—it’s practically drowning in cheddar and ground beef, putting its rivals to shame. The homemade meat sauce flaunts a balanced sweetness and tang, which will remind you of the spaghetti your mom makes at home. With its perfect sauce-to-noodle-to-cheese ratio and velvety and creamy red sauce (thanks to the chock-full of melted cheddar), it’s not impossible to end up thinking about this spaghetti for days to come. 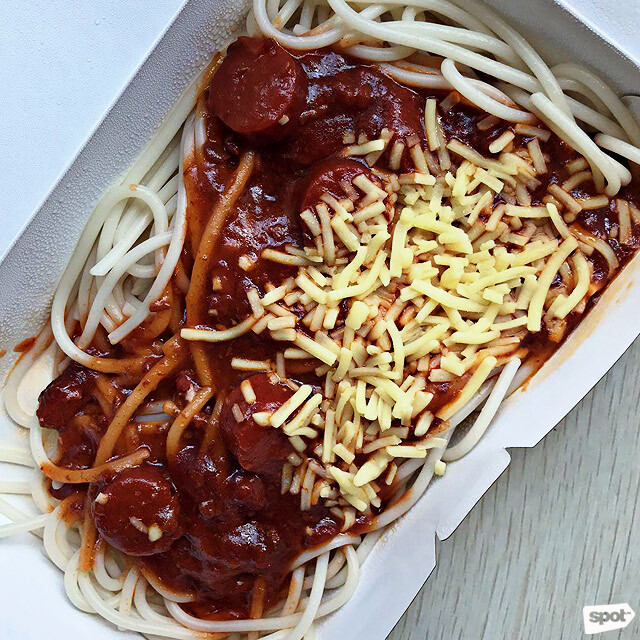 Cheesy Meattie Spaghetti is only offered at selected Mister Donut stores. Mister Donut is at UG/F Building A, SM Megamall, Ortigas, Mandaluyong City.